Spring is definitely coming to North Carolina, and although we are still getting a couple cold days, the weather is changing. Birds are back outside chirping, and the geese are back in enormous amounts making my puppy, Lola, go crazy :). I took advantage of a warm day and decided to wear out a dress from the American Rag line at Macy’s. American Rag is a Junior Plus-Size line, but I’ve been impressed with most of their clothes generous fitting. Some items still are too small, especially in the arm area, but I’ve been able to find some great items by them that fit me fine. This dress immediately caught my eye last time I was in my local Macy’s, and luckily for me it was the only one left and in my size. How often does that happen?! My family was heading out to celebrate my brother-in-laws birthday, so the dress was perfect for it. 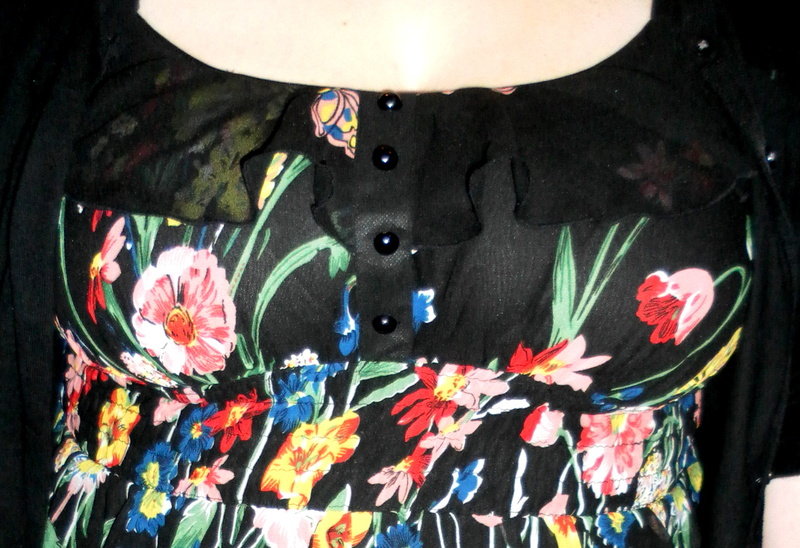 It has a beautiful floral/butterfly print and cute details on the chest area. I put on a cardigan since it’s still a little cool. There’s a cute ruffle along the neckline and buttons. I really love the fit, because, for me, tighter in the chest and then flowing out from there fits me best since I’m a size smaller on top than I am on bottom. I definitely want to wear this again with a colorful cardigan or maybe my jean jacket. The dress has an under skirt since the material is a bit see-through, but it was WAY too short. I took a tip from many of you bloggers and made a slip out of a stretchy black tank top. It worked perfectly on covering a bit more leg and nobody noticed! I really loved all of the different colors represented in the dress. As for the butterflies, I wasn’t sure how I felt about it. Mariah Carey kind of ruined those for me a long time ago, but ultimately I do like them. This is one of those outfits that as soon as you enter in a room to see people, they immediately compliment your appearance in the dress, so this dress is definitely a keeper. How is your wardrobe changing for spring? Do you have an outfit that immediately gets compliments? I love that dress! 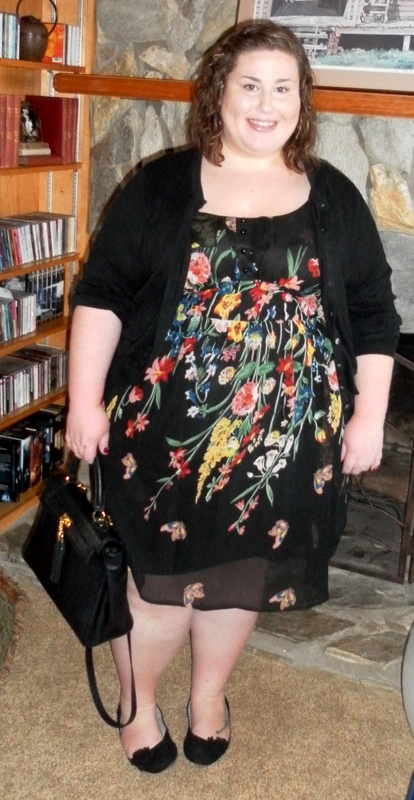 I’ve been really digging florals and sheer layers on dresses lately, this is perfect! So cute hun! I love all things bright and beautiful and this looks fabulous on you! Wow someone is looking really pretty in the dress! It is the perfect combination of spring dress with a dark edge. 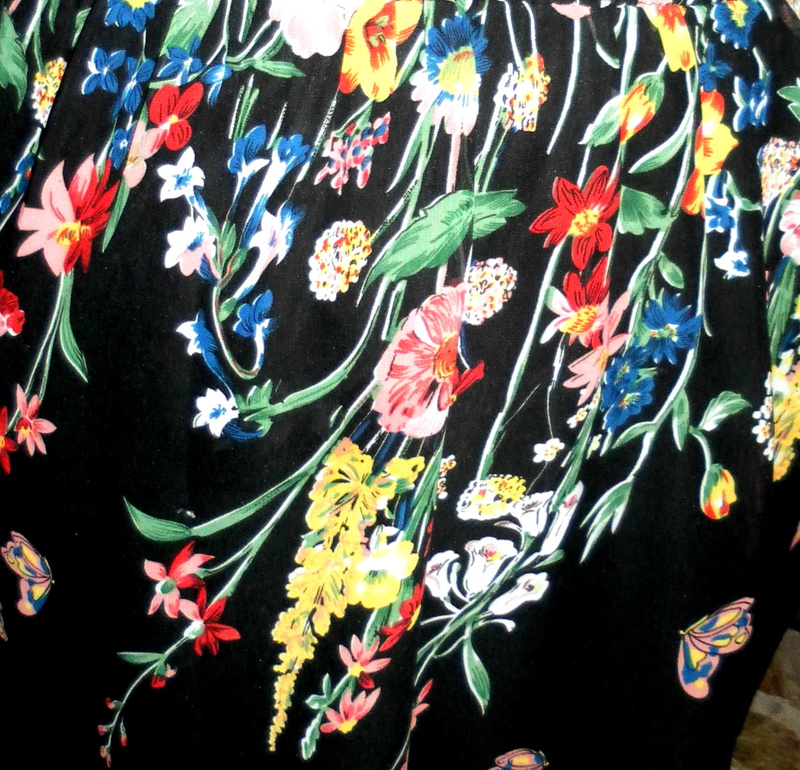 You know how some colour spring dresses would look weird if worn out for nights but this one has no problems at all. I do love the line of ruffle at the neckline! It is definitely very feminine and something I would like to wear.